PLANT NAME: Chamaesyce hirta (L.) Millsp. 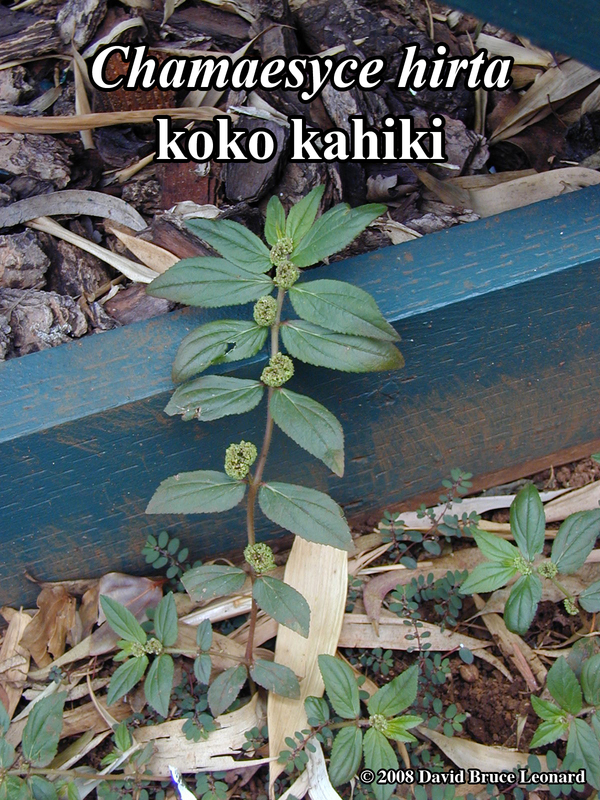 COMMON NAMES: Koko kahiki [Hawai’i]; pill bearing spurge [USA]; lal dudhi, paala, ariki thala [India]; amampatchaiarisi [Tamil]; boro-keruie [Bengali]; chara [Sanskrit]. USE AS FOOD: Young shoots cooked as famine food. RANGE: Pantropical. Native to Australia and India. HABITAT: It likes sun and thrives on abusive pathways and roadsides. TOXICITY: Reports of toxicity have been conflicting. Until more definitive research has been done: I do not recommend using this plant. Some sources list it as toxic [Huxley 1992] and possibly carcinogenic [Matthews 1994]. One animal study [Lanhers 1990] reported no toxic effects when the water extract was given either i.p. or orally. Photosensitivity, and severe inflammation have been reported from topical use. I have used it on myself topically many times with no untoward results, but everyone’s skin and system are different. CAUTIONS AND CONTRAINDICATIONS: DO NOT USE THIS PLANT. See Toxicity. Do not use during pregnancy. Can irritate the digestive system and cause vomiting. Sap can cause dermatitis and may be carcinogenic in large doses.